Fort Omaha (1868-1896, 1905-1947) - First established in 1868 as Camp Sherman (1) by Capt. William Sinclair (Cullum 1776), 3rd U.S. Artillery and named after Lt. Gen. William Tecumseh Sherman. In 1869 the post was renamed Omaha Barracks and finally renamed Fort Omaha on 30 Dec 1878. Abandoned in 1896 for Fort Crook (1) but reestablished several times until 1947. Also known as Sherman Barracks. Established 19 Aug 1868 as a post to supply troops to quell Indian uprisings on the plains. General George Crook, the famed Indian fighter, commanded the Department of the Platte from 1875-1882 and 1886-1888 from Omaha. 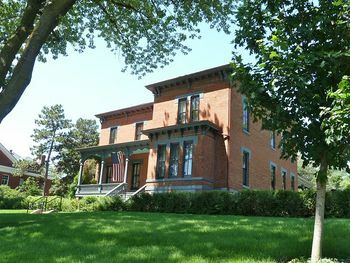 His 1879 quarters on Fort Omaha have been restored and refurnished with period furnishings. General Crook hosted General and Mrs. Ulysses S. Grant on a three day visit in November 1879 and President Rutherford B. Hayes reviewed on 3 Sep 1880. General Crook died 21 Mar 1990 and is buried in Arlington National Cemetery. 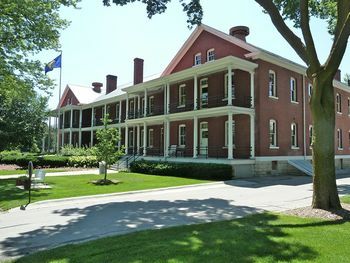 In 1870 the Department of the Platte was authorized 14 permanent posts under the command of Fort Omaha and the 1870s saw a building program on Fort Omaha to support the new role. Among the new buildings were a major brick headquarters building and new quarters for General Crook himself, both built in 1879. Fort Omaha was always a small post and was somewhat unusual because it was built on the side of a hill with the officers quarters at the high point and a parade that sloped down to the administrative buildings. The lack of space caused the Army to build a replacement post at Fort Crook (1) south of Omaha in Bellevue, Nebraska. Fort Crook (1) was completed in 1896 and Fort Omaha was ordered to be sold but the government was unable to get a suitable price and retained ownership. In 1905 the post was reactivated as a Signal Corps Balloon School. 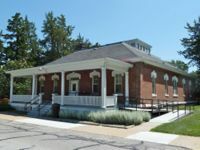 The post underwent a significant construction program starting in 1905 that replaced most of the remaining older wood frame buildings with classic military post brick structures. The first Signal Corps observation balloon flight was launched from the post in 1909. The post was again abandoned in 1913 when the Signal Corps School was moved to Fort Leavenworth. Fort Omaha was reactivated for World War I and again became the site of the military balloon school in 1916 as the Balloon Section of the American Expeditionary Force. In 1918 Fort Crook (1) became a sub post of Fort Omaha and served as a basic training center for recruits entering the balloon service. In 1919 the balloon equipment and troops were removed from both Fort Crook (1) and Fort Omaha and the entire school was removed by 1921. Fort Omaha was a support installation and an Italian POW work camp during World War II. In 1947, Headquarters, Fifth Army gave command of the Fort to the Navy, and Fort Omaha officially was named the Naval and Marine Corps Reserve Center. In 1951 Fort Omaha became the U.S. Naval Personnel Center and the Navy occupied Fort Omaha until 1974. In 1975 the Omaha Metropolitan Community College began using the post for instructional purposes. Remaining buildings on the Fort Omaha campus of Omaha Metropolitan Community College. 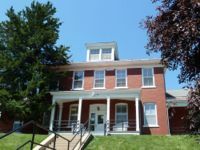 The Community College occupies the campus with the understanding that the historic parade ground and the exteriors of the brick buildings cannot be altered. Location: Metropolitan Community College, Omaha, Douglas County, Nebraska.